The origins of Pluckley Panto lie somewhere in 1984 following the Ghost Fayre organised by Anne Johnson to raise funds for the village hall, when a group was formed to produce a pantomime. Under the direction of Judy Pool the first production, Over the Rainbow, a very local version of The Wizard of Oz, was put together on a shoestring (with no costs wherever possible – most things begged, borrowed or stolen) for the express purpose of fund-raising for the village hall. Every performance was sold out as, since the closure of The Pluckley Players the village was eager for some live entertainment. The first audiences even trudged their way through several inches of snow to be there on the Saturday. The much-needed funds for the hall were raised and in January 1986 Pluckley Panto Unlimited was born. 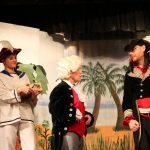 Since then, under various scriptwriters and directors, a pantomime has been produced every year, performed usually on the last weekend in January or the first weekend in February. 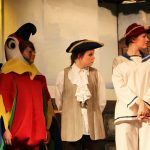 Sometimes the money raised has been split between different local charities, but at the moment the group is trying to refurbish the stage equipment, carpet and scenery as much of it is over thirty years old, so any profits made are being used to fund these projects. In recent years the group purchased a memorial bench dedicated to much loved members of the group who have sadly passed on and last year enough money was raised to purchase a storage shed for props and scenery. 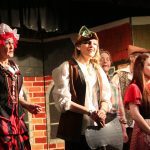 The list of past pantomimes is extensive and in 2016 the group put on their 31st production with another version of Cinderella, which was entirely original and very well received by the audiences. In recent years many younger performers have joined who, apart from enhancing the shows with their theatrical prowess, are also very enthusiastic about taking the group well into the future. Judy Pool is very hopeful that they will do this as the older members are now heading towards retirement! You can see some of the photos taken of recent performances by clicking on the thumbnails below.